﻿Plan ahead for the tastiest, easiest outdoor meals. ﻿Whether you are a gourmet or journeyman cook, camp cooking can be challenging. However, utilizing simple strategies can help you produce delicious, nutritious meals to fuel outdoor adventurers. The most important strategy: planning. Plan meals and snacks in advance. Keep in mind that you might not want to spend hours cooking in primitive conditions. Having ingredients pre-cooked, pre-packaged or pre-chopped allows the cook to get meals on the picnic table more quickly and with less stress. Remember, too, you will be grilling or cooking on a camp stove. The first challenge is the first night. “Setting up camp the first night, after hours on the road, can drain a family of energy and patience,” says veteran camper Ava Jenkins of Keller. “The first night’s food menu should be as simple as possible.” Her family serves chili with corn chips or heats an already cooked stew. Breakfasts can be fancy or quick, depending on the day’s activities. Lona Flocke of Wimberley, who has prepared many al fresco meals for her brood, packs batches of dry pancake ingredients in plastic baggies, adding liquids before cooking. “The best breakfasts include berries picked fresh in the wild and added to the pancakes,” she says. Jenkins uses a commercially prepared pancake mix in a plastic jug: Just add water, shake and pour. She notes that pre-cooked bacon makes breakfast tacos a snap. My family brings hard-boiled eggs, oranges, granola bars and cereal for quick breakfasts. For lunch, fast and light is the ticket. We bring canned tuna and sardines, as well as fixings for peanut butter and jelly sandwiches. Pitas and tortillas travel well and can be filled with various ingredients. “When hiking, we prefer crackers, meat and cheese to sandwiches because you don’t have to be careful with them,” says Flocke. Apples, oranges and dried fruit also pack well. Grilling is the obvious choice for supper. We grill sausage, steak or chicken breasts, along with vegetables like zucchini. Kebabs are an easy option: Simply load up skewers with your choice of marinated meat and vegetables and grill. Many camp cooks utilize foil pouches on the grill or in the coals. Flocke cooks fresh fish this way, but it can be used for other meats or vegetables, too. Other easy options include spaghetti (add pre-cooked meat to jar sauce) or soft tacos (tortillas filled with hamburger meat, beans, lettuce, grated cheese and salsa). Side dishes include canned beans, couscous or pasta. Flocke’s family makes a roll-up salad: place cut vegetables along with dressing on large lettuce leaves, roll up and enjoy! One helpful website suggests bringing foods that can be used multiple ways: potatoes, onions, pre-cooked bacon. Carrots and celery cut up in advance can double as lunch food and dinner ingredients. Bagged salad can be used alone, or on sandwiches and pitas or in soft tacos. Grated cheese … well, you get the idea. Be sure to pack your favorite spices and basic cooking staples, like oil. Don’t forget dessert! We bring the basics: hot chocolate, pudding cups, marshmallows (for roasting and s’mores) and cookies. For special treats, Jenkins makes banana boats or fruit kebabs. 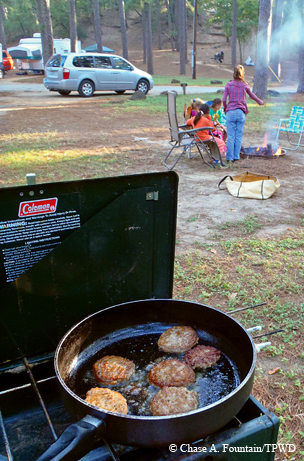 These experienced campers offer a few more hints for successful camp cooking. Flocke notes that she stocks enough food to last until the next grocery stop, with a few extra meal options. She also has a backup plan for every meal — smart when camping! Jenkins freezes foods like stew to use as temporary ice for the cooler. She also freezes water in empty milk jugs for inexpensive and long-lasting cooler ice. Salt and pepper meat. Brown with garlic in oil over medium heat. Add chopped onions and sauté until translucent. Add remaining ingredients, and add water to cover all. Bring to a boil; reduce heat and simmer, stirring frequently, for 1½ hours. Add water if necessary at higher altitudes. Serves 6 to 8. Load a fresh-caught fish filet, butter, onion, carrot slices (or other vegetables), lemon, salt and pepper into foil folded into a packet. Use two layers or heavy-duty foil and seal tightly; after cooking, open one packet to check for doneness. Lay out a large piece of foil. Place generous amount of sliced red potatoes on it, sliced onions, salt and pepper. Sprinkle grated cheese on top (can add diced ham). Wrap tightly, but package needs to be flat to allow even cooking. Cook for 45 minutes to an hour. Gently peel back but don’t tear the husks. Discard the silk strands and replace the husks. Tear off one husk and use to tie all the ends of the husks together above the cob. Soak in water for 15 minutes before putting on the grill. Cook about 15 minutes, turning every five minutes or so when husks turn brown. When done, snip ends and peel back husks. Load with butter. In a bowl, combine 2 tablespoons olive oil, Kosher salt and lemon juice to taste. Toss with asparagus. Place asparagus on the grill. Turn often. It takes only about five minutes, and the smoky flavor is heavenly! Cut off an 8-by-10-inch piece of aluminum foil. Peel a banana and put it in the center of the foil. Make a shallow slice down the length of the banana. (Do not cut all the way through the banana or you won’t have a boat.) Fill the opening with miniature marshmallows and miniature chocolate chips. Bring foil ends together above the boat and fold together. Twist ends of foil tightly. Place on the grill or in the coals. Cook until banana is soft and chocolate is melted. It is gooey, so eat right out of the foil with a spoon. Thread fruit pieces (pineapple, bananas, peaches and plums are good for this) onto skewers. Place skewers on the grill and baste with rum sauce (recipe below). Cook for about 10 minutes, turning and basting occasionally. To cook: Add 3 cups of water to the dry mix and bring it to a boil in a saucepan. Simmer for about five minutes until thick. Serves 4.